The U.S. Food and Drug Administration (FDA) has approved the expanded use of the SAPIEN 3 transcatheter heart valve, a non-surgical treatment option for patients with failing aortic valves. The SAPIEN family of valves, developed by Edwards Lifesciences, has been under study and in use at the Emory Heart & Vascular Center since 2007. The valve offers a lifesaving alternative for patients with aortic stenosis, a serious heart condition that affects tens of thousands of Americans each year when the aortic valve tightens or narrows, preventing blood from flowing through normally. The newly announced FDA approval will allow the SAPIEN 3 valve to be used in the treatment of patients who are at intermediate-risk of open-heart surgery with severe, symptomatic aortic stenosis. 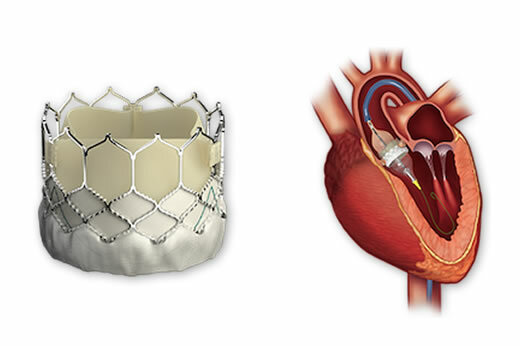 The SAPIEN 3 was approved by the FDA in June 2015 for the treatment of high-risk patients with severe, symptomatic aortic stenosis who are not candidates for open-heart valve replacement surgery. During the procedure, the physician threads a replacement tissue valve to the heart through a catheter placed in the groin or ribs. “The SAPIEN 3 valve has set a new standard for performance and patient outcomes with aortic valve replacement,” says Vinod H. Thourani, MD, professor of surgery and medicine, Emory University School of Medicine and chief of cardiothoracic surgery at Emory University Hospital Midtown and co-director of the Emory Structural Heart and Valve Center with Vasilis Babaliaros, MD. Thourani, Babaliaros and their Emory colleagues are celebrating a milestone this month, performing 1,500 TAVR procedures to date. Combined, they have the largest experience in the Southeastern U.S. and Emory was one of the highest volume centers participating in the valve’s clinical trial. Emory Healthcare's comprehensive, cross-functional Structural Heart & Valve Center is a one-stop institution for all types of cardiac valve and defect treatments, from medical management to traditional surgical care. The Center offers full-service locations at Emory University Hospital, Emory University Hospital Midtown and Emory Saint Joseph’s Hospital. For more information, please click here.